Foreign direct investment is a lead economic component which indicates the investment climate in the economy and helps build investors' confidence domestically and internationally. FDI helps to create technological advancements, increase competitiveness of the industry, enhance capital stock, step up infrastructural base and thus reflects the overall level of prosperity in the economy. Post liberalization of Indian economy since 1991s, India has gone a long way in attracting FDI from different economies of the world across an entire gamut of sectors. With the continuous pace of reforms, FDI up to 100% is allowed under the automatic route in many sectors of the Indian economy. The objective of inviting large chunks of FDI is to provide better career prospects to our youth, to generate employment opportunities and to give a push to overall economic growth and development. With the advent of continuous pace of reforms in attracting FDI, Indian economy has scripted its presence as one of the fastest growing economies of the world economic system and has emerged as a key destination for attracting FDI in the recent years. Foreign companies invest in India to take advantage of relatively lower wages, availability of large scale skilled, unskilled and semi skilled workforce and special investment privileges such as tax exemptions. Today, India has been considered as one of the favourite FDI investment destinations across the world. The total annual FDI inflows to India have increased by nine fold over the last fifteen years. FDIs were at USD 6.1 billion in FY2002, which scaled up to USD 55.5 billion in FY2016. 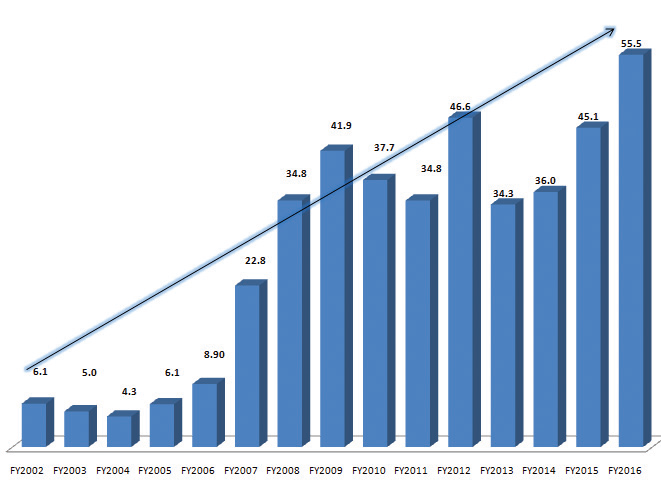 FDI inflows growth remains steady over the past fifteen years with a CAGR of 16%. The FDI growth was at 52.1% in FY2002, which scaled up to a peak level of 155% in FY2007 during the period of five years. Further, FDI inflows growth was at 34% in FY2012 and stands at about 23% in FY2016. Among the top ten investing countries in India, Mauritius is the largest investor with a share of 33% in total FDI equity inflows during April 2000 to March 2016, followed by Singapore with a share if 16%, U.K. at 8%, Japan at 7%, USA and Netherlands at 6% each, Germany and Cyprus at 3% each, France at 2% and UAE at 1%. Services sector is holding the largest pie in the total FDI equity inflows at about 18% during the period April 2000 to March’16, followed by construction development sector at about 8%, computer software and hardware contributing share of about 7% in total FDI equity inflows. Among the top ten states or UTs attracting FDI equity inflows, Mumbai is attracting the largest share of total FDI equity inflows at 29% during April 2000 to March 2016, followed by New Delhi at 22%, Chennai and Bangalore at 7% each and Ahmedabad at 5%. Over the years, Government of India has brought major FDI policy reforms in a number of sectors viz. Defence, Construction Development, Insurance, Pension Sector, Broadcasting Sector, Tea, Coffee, Rubber, Cardamom, Palm Oil Tree and Olive Oil Tree Plantations, Single Brand Retail Trading, Manufacturing Sector, Limited Liability Partnerships, Civil Aviation, Credit Information Companies, Satellites- establishment/operation and Asset Reconstruction Companies. However, keeping in view our economy’s potential to attract far more foreign investment, Government has recently in June 2016 further liberalized and simplified the FDI regime particularly for food products, defence sector, broadcasting carriage services, pharmaceutical, civil aviation, private security agencies, establishment of branch office, liaison office or project office, animal Husbandry and single brand retailing. In order to boost the investment environment and attract large chunks of investments, Government has recently liberalised FDI norms in sectors such as food products manufacturing, defence sector, broadcasting carriage services, pharmaceutical, civil aviation, private security agencies, establishment of branch office, liaison office or project office, animal Husbandry and single brand retail trading which are discussed below. *Food products manufactured/produced in India- Government has permitted 100% FDI under government approval route for trading, including through e-commerce, in respect of food products manufactured or produced in India. *Defence Sector - Present regime permits 49% FDI participation in the equity of a company under automatic route. Foreign investment beyond 49% has now been permitted through government approval route. FDI limit for defence sector has also been made applicable to Manufacturing of Small Arms and Ammunitions covered under Arms Act 1959. *Pharmaceutical- The extant policy on pharmaceutical sector provides 100% FDI under automatic route in greenfield pharma and up to 100% under government approval in brownfield pharma. With the objective of promoting the development of this sector, it has been decided to permit up to 74% FDI under automatic route in brownfield pharmaceuticals and government approval route beyond 74% will continue. *Civil Aviation Sector- The extant policy on Airports permits 100% FDI under automatic route in Greenfield Projects and 74% FDI in Brownfield Projects under automatic route. FDI beyond 74% for Brownfield Projects is under government route. Now, 100% FDI is permitted under automatic route in Brownfield Airport projects. As per the present FDI policy, foreign investment up to 49% is allowed under automatic route in Scheduled Air Transport Service/ Domestic Scheduled Passenger Airline and regional Air Transport Service. It has now been decided to raise this limit to 100%, with FDI up to 49% permitted under automatic route and FDI beyond 49% through Government approval. For NRIs, 100% FDI will continue to be allowed under automatic route. However, foreign airlines would continue to be allowed to invest in capital of Indian companies operating scheduled and non-scheduled air-transport services up to the limit of 49% of their paid up capital and subject to the laid down conditions in the existing policy. *Private Security Agencies- The extant policy permits 49% FDI under government approval route in Private Security Agencies. FDI up to 49% is now permitted under automatic route in this sector and FDI beyond 49% and up to 74% would be permitted with government approval route. *Establishment of branch office, liaison office or project office- For establishment of branch office, liaison office or project office or any other place of business in India if the principal business of the applicant is Defence, Telecom, Private Security or Information and Broadcasting, it has been decided that approval of Reserve Bank of India or separate security clearance would not be required in cases where FIPB approval or license/permission by the concerned Ministry/Regulator has already been granted. *Animal Husbandry- As per FDI Policy 2016, FDI in Animal Husbandry (including breeding of dogs), Pisciculture, Aquaculture and Apiculture is allowed 100% under Automatic Route under controlled conditions. It has been decided to do away with this requirement of ‘controlled conditions’ for FDI in these activities. *Single Brand Retail Trading- It has now been decided to relax local sourcing norms up to three years and a relaxed sourcing regime for another five years for entities undertaking Single Brand Retail Trading of products having ‘state-of-art’ and ‘cutting edge’ technology. With the easing of recent FDI reforms, the process of inviting foreign investments is simplified to save time and energy of the investors. The increase in sectoral caps, bringing more activities under automatic route and easing of conditionalities for foreign investment will make India a more open economy in the world economic system. The FDI policy pronouncements will help in creating additional jobs as well as induce employment and spur up the Make-in-India program with emphasis on driving both foreign and domestic investments. The domestic investment environment will also be boosted with large scale foreign investments offerings in the promising sectors of the economy. Further, millions of the youth of our country will be benefitted as remunerative employment or entrepreneurial opportunities will be created in the coming times. *Food products manufactured or produced in India : To provide impetus to the country’s food processing sector and facilitate in strengthening agri infrastructure. *Defence Sector : To facilitate investments from several global defence companies for setting up of manufacturing base in India and to promote prestigious Make in India initiative of the Government. *Broadcasting Carriage Services : To facilitate implementation of speedy process of digitization and promote infrastructure development, better satellite capacity and expected to enhance multi system operators in rural markets. *Pharmaceutical : FDI up to 74% under automatic route in brownfield pharmaceuticals to boost mergers and acquisitions and private equity investments in the sector. *Civil Aviation Sector : To encourage modernization of the existing airports to establish a high standard and help ease the pressure on the existing airports. *Private Security Agencies : To expedite investments in private security sector and enhance skill development of security guards. This will further open up avenues for generating employment opportunities particularly among the young unskilled workforce. *Establishment of branch office, liaison office or project office : To promote ease of setting up of branch offices, liaison offices or project offices in cases where the principal business is of Defence, Telecom, Private Security or Information and Broadcasting. *Animal Husbandry : To promote development of animal husbandry sector, invite several research and development agencies in bringing their new and modern technology to India to improve animal breeds in our country. *Single Brand Retail Trading : To enhance investments in single brand retail and promote technological development in the sector. Setting up of manufacturing units in India will be promoted and employment opportunities will be generated in the economy. Foreign Direct Investments plays a crucial role for an accelerated economic growth. In India, post the 1991 economic reforms, the regulatory environment in terms of Foreign Direct Investments has been consistently eased to make it more and more investor-friendly and to supplement domestic capital, technology and skills. Recent FDI policy pronouncements in various sectors of the economy are expected to attract chunk of investments and create additional jobs as well as induce employment and spur up the Make-in-India program. Increase in sectoral caps, bringing more activities under automatic route and easing of conditionalities for foreign investment will make India a more open economy in the world economic system. FDI reforms were very crucial at this juncture which will lead to further FDI inflows which already increased from around US$36 billion in FY2014 to US$55.5 billion in FY2016 due to recent initiatives of the government. Pro-active reforms oriented decisions taken by the government particularly for easing of FDI rules in various sectors of the economy are going to push employment generation, youth empowerment and a boost overall economic growth in the coming times. To sum up, India has only recently begun to attract global capital and given the size of the economy, and its perceived high growth potential, it will remain an attractive investment destination as long as policy towards investment in general and FDI in particular is seen to be supportive. Hence, the Government must continue the pace of reforms to make India more and more attractive for Make in India. -With inputs from Surbhi Sharma.